Royal Mail has issued stamps that depict ten leaps in engineering that have seen the UK’s bridges evolve from humble stone crossings to iconic landmarks and construction triumphs. We've selected some great walking and cycling trails that take you over, under, or give spectacular views of these engineering marvels. The stamp images feature British bridges conceived by progressive architects and engineers and constructed from a wide range of different materials, including gritstone, limestone, cast iron, wrought iron and steel, and reference diverse styles of bridge engineering, from clapper and stone arch to suspension and bowstring girder. 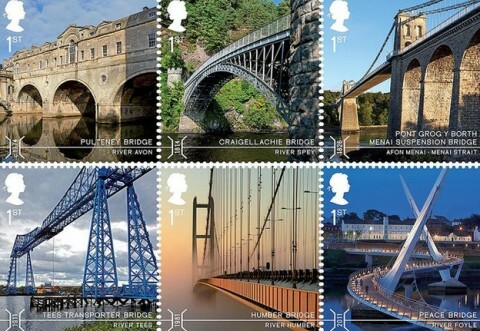 Bridges featured on the stamps are: Tarr Steps; Row Bridge; Pulteney Bridge; Craigellachie Bridge; Pont Grog y Borth (Menai Suspension Bridge); High Level Bridge; Royal Border Bridge; Tees Transporter Bridge; Humber Bridge and the Peace Bridge in Northern Ireland. This is a lovely circular walk starting and ending at the main car park of Tarr Steps and taking in Winscombe Hill, published by ViewRanger user Steve. This hike from ViewRanger user, and appropriately named, Jeff Bridge is a round trip. Start at the Wasdale Head Inn and cross the Row Bridge before heading out on a loop taking in the Scafell Pikes. This is a route with a significant climb up Scafell. The magnificent architecture along the way of this walk, from Walkingworld, whether it be the Georgian terraces of Great Pulteney Street, the Holbourne Museum or Pulteney Bridge spanning the River Avon, will leave you in no doubt as to why Bath is one of the few European Heritage Sites in Britain. A stroll taking in views of all five Bridges over the Tyne linking Newcastle and Gateshead. It starts and finishes in the Quayside area, so there is plenty of opportunity for refreshment. ViewRanger user Darren Brown takes us on a mixed surface ride across the Humber Bridge itself and round the lakes on the southern side. This looped cycling route from Cycle Northern Ireland starts from near the Peace Bridge. 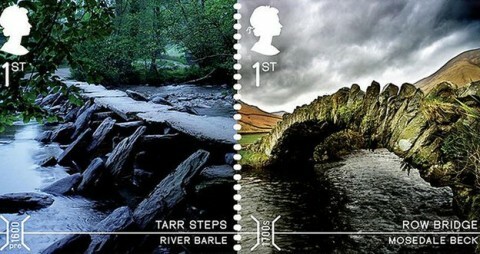 The stamps are on sale now and available at www.royalmail.com/bridges ,and in 8000 Post Offices across the UK.